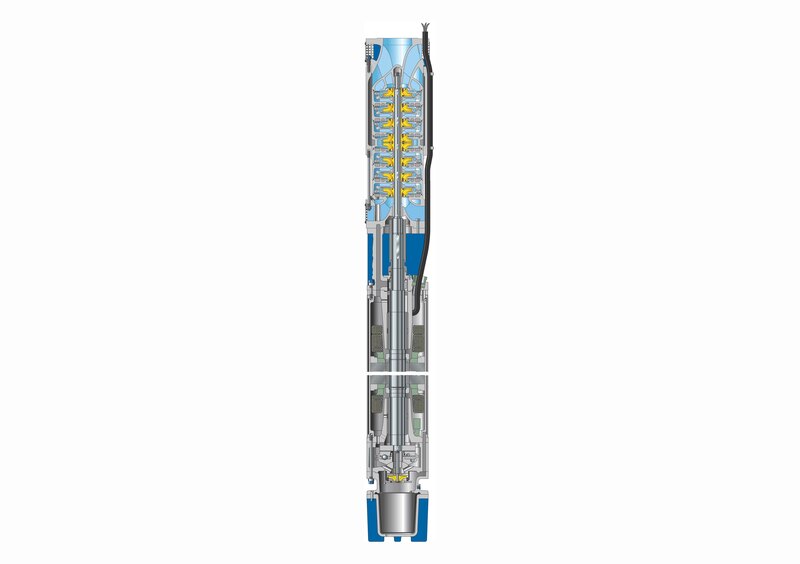 From October 2018, KSB SE & Co., Frankenthal, Germany, is extending its portfolio of submersible borehole pumps. The new sizes developed by KSB have a diameter of up to 50 inches, i.e. 1250 mm, and a drive rating of up to 5 MW. These pumps will be capable of handling flow rates of up to 5000 m³ per hour at heads of up to 1500 m.
Compared with dry-installed pump sets, the advantage of submersible borehole pumps is the notably longer service life and the fact that pumps with wet motors are not compromised by flooding. KSB is one of the few manufacturers worldwide to offer double-entry designs for particularly high load conditions alongside “normal” single-entry designs. This double-entry design was originally used for drainage applications in mines. The heads required in these applications would have created very high axial thrusts in single-entry pump designs, placing extremely high loads on the bearings. The back-to-back impeller arrangement employed in double-entry designs not only reduces the axial thrust but also the associated bearing loads. The growing scale of such projects in the last few years has resulted in a steady increase in the volume flow rates demanded of the pumps installed, which in turn has required ever larger pump sizes. And this does not only apply to projects in mining. The demand for increasingly higher pump outputs also manifests itself in water supply, cavern and offshore applications. The drives employed in these pumps are water-filled high-voltage motors for voltages from 1 kV to 11 kV. A proven pressure equalisation system ensures that the motors are not exposed to loads due to pressure differences potentially occurring under water. This prolongs their service life rendering regular maintenance unnecessary. The pump sets have been developed completely in-house by the pump manufacturer and are manufactured at its German production location in Frankenthal.